Picking up from and recapping my last post, three of us were paddling the lowest stretch of the North Fork White River before it enters the lake. 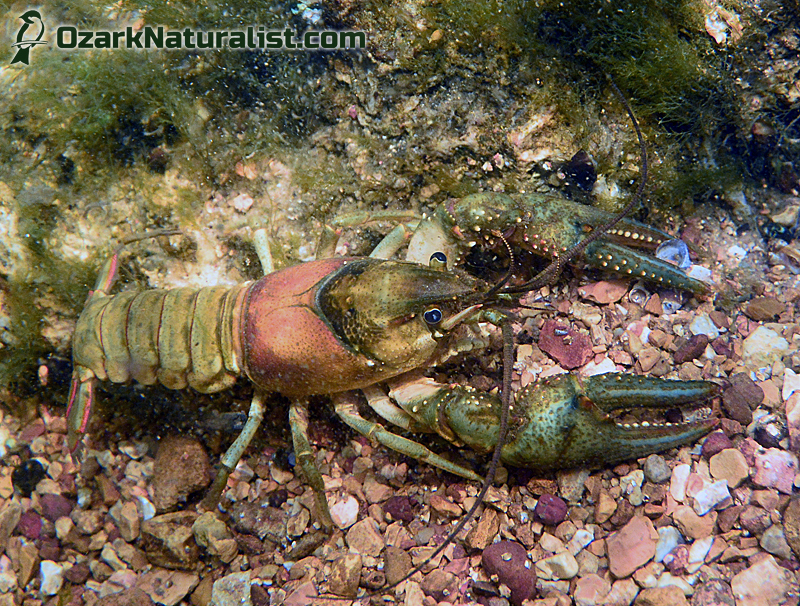 Having pulled over below the bridge at Patrick Bridge Access to snorkel and photograph fish, I kept getting distracted by crayfish. After photographing the Gap Ringed Crayfish from the last post, I moved out of the eddy and into the edge of swift run below the main riffle. The water was deeper and the rocks larger and I began turning rocks, expecting (hoping!) 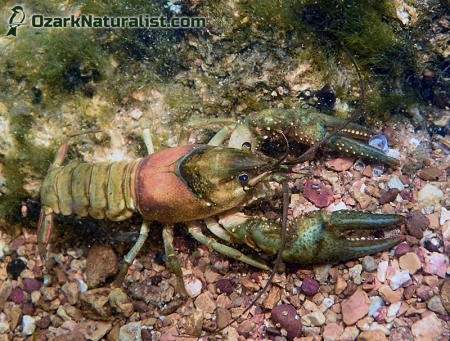 to find a Longpincered Crayfish (Orconectes longidigitus), preferably a really big one. Instead, I found several Spothanded Crayfish (O. punctimanus), including six under one lovely large, flat rock. 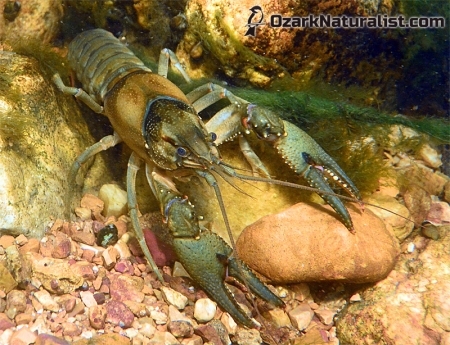 Spothanded Crayfish, as their name so subtly intimates, almost always have a very bold spot on their pincer, at the base of the moveable finger. 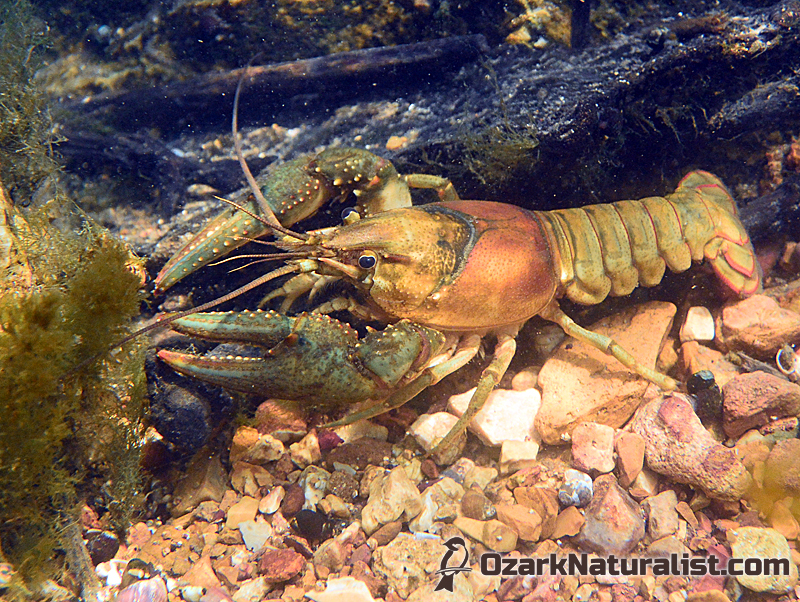 Now that’s not true in all drainages O. punctimanus occurs in, but it is in the North Fork. So I was a little surprised when the first one I found had a very indistinct spot, reminiscent of Meramec and Black River specimens. 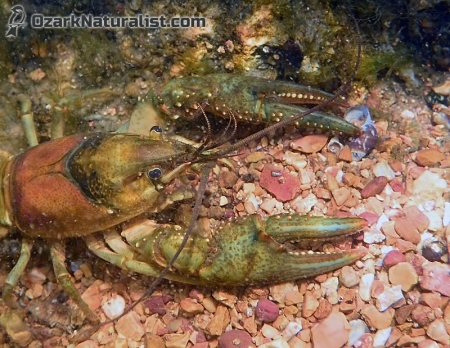 That, combined with the yellowish tubercles and blue on the pincers, made me think for a second that this might be a Northern Crayfish (O. virilis). But O. punctimanus often has both tubercles and blue on the fingers, but no O. virilis has a saddle mark across the back of the carapace or the red trim on the abdominal segments and tail. 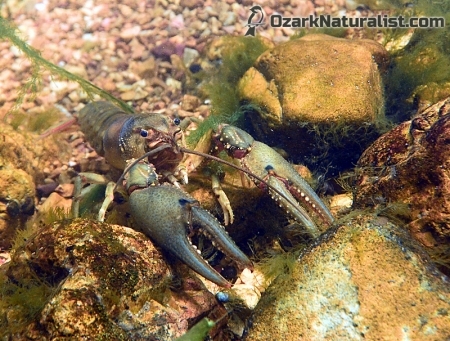 There can be a lot of variation within a population of crayfish and this was an O. punctimanus . A close-up of the same crayfish—those antennules look rather like tentacles, don’t you think? In a creepy, Lovecraftian way, not like an octopus or squid. Now we finally get to a few more typical specimens, with big, bold spots on the claws. 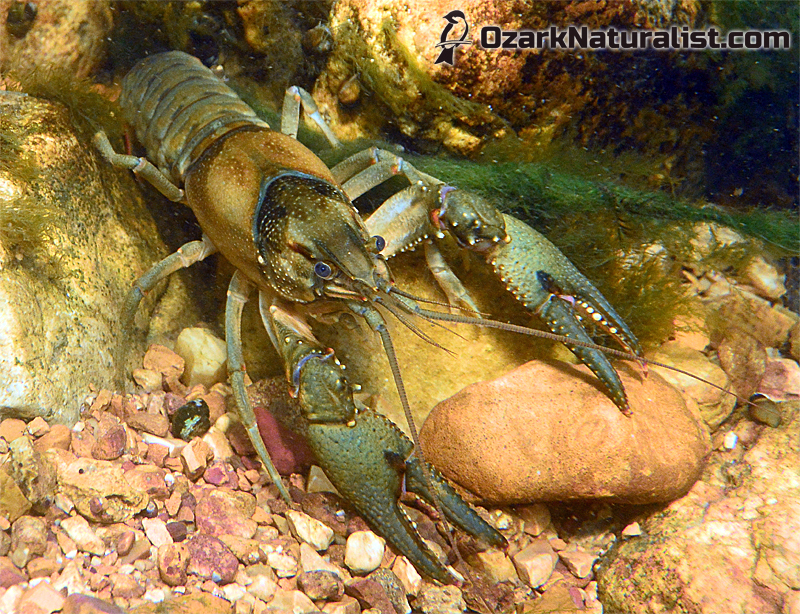 These were all large crayfish, in the neighborhood of 3-1/2 to 4 inches. But like all fishing stories ever, you should have seen the one that got away. I was trying to roll one especially large, flat rock (lifting the side opposite myself) and managed to get it high enough that I could almost see what was under it. Sticking out from underneath was a claw. A very large claw. It clearly belonged to another O. punctimanus, but it was enormous, nearly as long as my finger, 2-1/2 inches maybe. 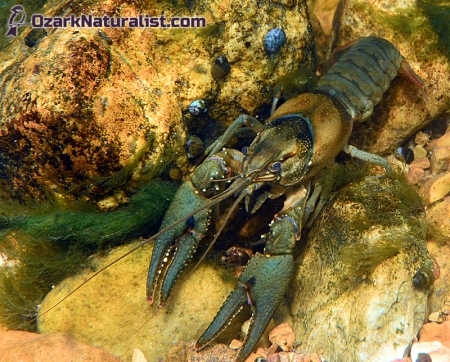 I can’t say how long the crayfish attached to it was—as large as it was, it managed to slip away without me actually laying eyes on anything other than that single claw. But the largest O. punctimanus I’ve ever actually measured was 4.1 inches. It also came from the North Fork, though a long way upstream, near Hebron. I believe that, had I managed to get a look at this one and catch it if possible, it would have dwarfed the one from Hebron. Leviathan. I may follow this post up with one more before moving on. Despite my griping, I did get a few decent fish photos and I’d like to get them online. We’ll see. I’m planning to return to the drainage tomorrow (Bryant Creek instead of the North Fork) to try to photograph the Duskystripe Shiner, which was my original goal for this trip. Wish me luck!